VELOUR LUXURY BOURGEOISIE RED - 75% Cotton and 25% Polyester. Velour was chosen because of it's thin multi-layer fabric that gives the pillow the luxurious glow we all love. With 4.5D density you get the full comfort of memory foam and freedom to move your neck. UNIQUE DESIGN - Offers maximum lower neck support with centre spine; Quality Cervical neck support; Button lock holds it in place; ideal for home, car, office or plane. 10% of all earnings in profit will be donated to raise awareness about GLOBAL WARMING by partnering up with World Wildlife Organization. All proceedings will go to its 'ADOPT A POLAR BEAR' program, saving polar bears from losing their natural habitat. COOLING GEL LUMBAR SUPPORT - Prevents Excess Heat, reduces neck pain and muscle tension while travelling with this Pillow. We use thin layer A grade of cooling gel. Our cooling gel is highly absorbent preventing your neck from getting overheated and the thin layer allows you to feel the full comfort of memory foam without feeling like sleeping on liquid. PREMIUM QUALITY, A GRADE, MEMORY FOAM - incomparable to inflatable and bead pillows, the Viscoelastic material is designed to rebound slowly and conform to pressure exerted against it. Perfect Rebound Time for Quality Memory Foam is 3-5 seconds. 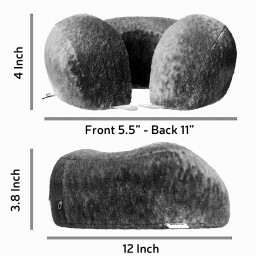 Our Premium 4.5D Memory Comfort Neck Pillow averaged at 3 seconds (best score for memory foam). Ever since I got this neck pillow I've hardly had the chance to use it because of this kid... It's ridiculously soft though and apparently won the cool neck pillow award. So who am I to argue? Https://www.giveawayservice.com/p/f1d5e1e2/d8b2b9f2 This Pillow Is Great For People On Long Car Trips. The First Thing I Noticed About This When I Pulled It Out Of The Box Was The Smell. IT Smells Like Pretty Much Any Down Pillow Does, With The Distinct Smell Of The Weird Duck Poop Thing. The Pillow Comes With A Nice Travel Bag So You Can Take It Places Easier, And The Fabric On It Is A Very Plush Feeling Microfiber. The Pillow Has A Nice Heft To It, And A Snap So You Can Keep It Around Your Neck. The Cooling Gel Is Awesome, Because It Allows Me To Use The Pillow For A Long Time And It Never Gets Too Warm For Me. Since I Like Cooler Pillows, That Is An Awesome Thing To Have. The Pillow Goes From Compressed To Fully Expanded In About 5 Seconds, Which Holds True Even If I Stand On It! That's Pretty Fast, And Also Completely Unnecessary For A Neck Pillow, But I'll Take It. The Pillow Case Comes Off Pretty Easily In Case You Need To Wash It, And You Can Also Wash The Carry Bag, So You Shouldn't Worry About Getting The Pillow Too Dirty. I Like The Gray Color, And The Firmness Of The Pillow Is Great For Tons Of Applications, From Work To Using It To Prop You Away From A Couch. I Can't Wait To Take This On A Long Car Trip Again, Since It Saved My Neck Last Time. This Neck Pillow Came Quickly And After Weeks Of Testing, I Have To Say That I Am Absolutely In Love With It! 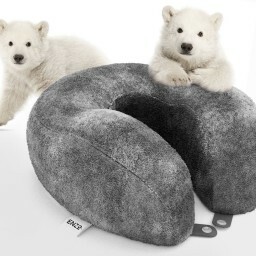 Composed Of Memory Foam And Gel Layer, Enzo Travel Neck Pillow Is Extremely Soft And Comfortable To The Touch. Not Only Is The Cover Soft To The Touch, It's Removable Too! This Is Extremely Important As It Allows You To Wash The Cover After Traveling. I Would Definitely Purchase This Pillow Again! Enzo Travel Neck Pillow With Memory Foam And Cooling Gel Travel Neck Pillow With Memory Foam Inside Measures Twelve Inches In Length And Eleven Inches In Width. The Cover Is Made Of Velour Cover. The Inside Of The Pillow Is Gel Memory Foam. This Pillow Is Like Laying In Cotton. It Stays Cool To The Touch No Matter Where It Laid. It Feels So Comfortable That I Immediately Go To Sleep. The Pillow Conforms To My Neck And Head Due To The Fact It Has Memory Form In It. Great Travel Cooling Gel Neck Pillow : Product Link: Https://www.giveawayservice.com/p/f1d5e1e2/d9c7e0d2e1 I Must Say That I Really Like It A Lot. Initially I Thought That It Is Very Bulky, But Cooling Gel And Very Soft Construction, Makes It Fit Well Around My Neck And It Is Super Comfortable. I Have Really Enjoyed Using This On My Long Road Trips, It Has A Cooling Gel In It Which Helps Keep Ya Cool And Also Comfortable To Be Able To Sleep On The Move. I Travel A Lot Specially Especially For Lot Of Business Trips And Now I Feel Very Comfortable With This Pillow. It Comes In Nice Carry Case Which Is A Sweet Feature. I Have Been Also Keeping It In Car, Since It Is A Great Benefit To Have Such Pillow On Long Road Drives. I Tell You, At First Glance, It May Look Bulky But Trust Me, It Is Supercomfortable And You Will Fall In Love With It. It Has Great, Velvety Material Feel And Very Soft. I Really Love This Product, Very Happy With It And I Recommend To Everyone. Wow! This Travel Pillow By Enzo Is Super Comfy! Check It Out! Husband Is A Conductor And Suffers From Tension Headaches. This Memory Foam Neck Pillow Is Exactly What He Needed. Awesome Pillow. 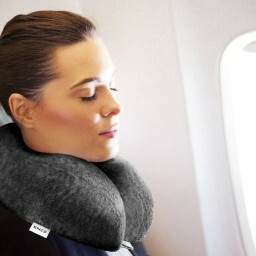 Https://www.giveawayservice.com/p/f1d5e1e2/f0b4b0a5 Enzo Travel Neck Pillow - Is Ideal For Busy Travelers. Well Made And Super Soft And Comfortable. Must Have In My Travel Bag And Allows Me To Get Some Rest On Those Long Flights. Very comfortable and soft pillow. It comes in a nice drawstring bag for storage and I love the button on the front to connect both sides just under your chin. Perfect for air travel.